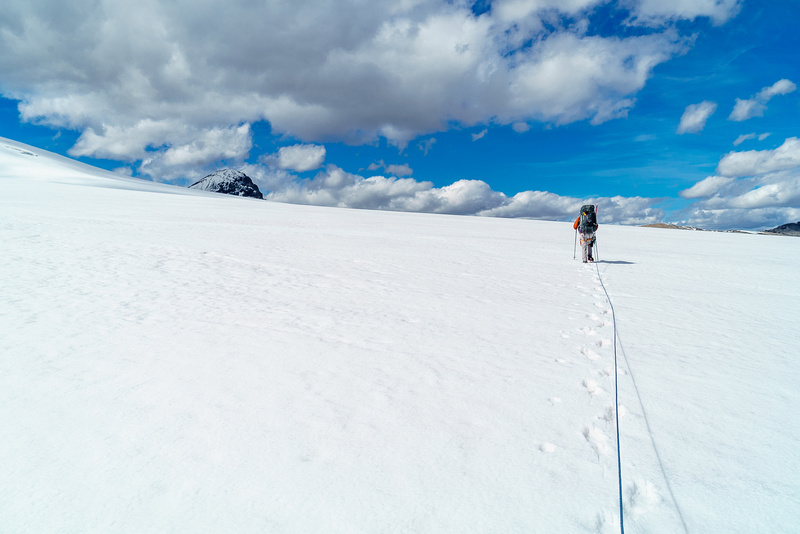 Difficulty Notes: Depending on conditions this is either a snow trudge with some scree / glacier thrown in or a scree bash with crevasse hazards. The actual south ridge is nothing more than easy scrambling if dry. Mount Brazeau has been on my radar for many years already. I wasn’t in a huge rush to do it however, because I knew it was a relatively easy 11,000er and could be done in almost any conditions and in any season, from full-on winter conditions to mid-summer ones. Or could it? 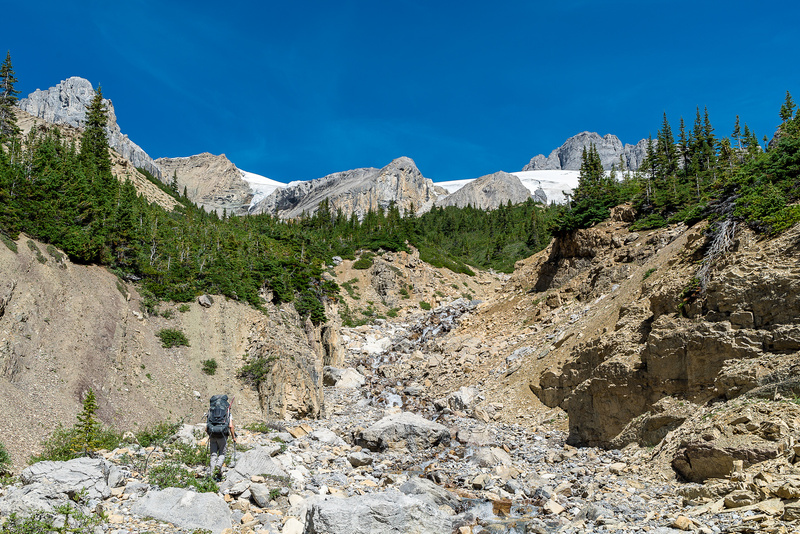 Ben and I set out on July 30th 2015 from the Poboktan Creek trailhead to find out how Mount Brazeau and its neighboring peaks would behave in an extremely dry year in the Canadian Rockies. Considering other trip reports from around the same time, we wondered how different our conditions would be. I left Calgary at 04:00 and we found ourselves leaving the cars at a very non-alpine start time of 09:00 (!!) under a very warm and pleasant sun. The Sunwapta Warden station and trailhead for Poboktan Creek (“Poboktan” is the Stoney word for “owl” which Arthur Coleman named the creek / pass after in 1892 after presumably spotting a number of these birds on his travels in the area. ), sit on the north side of the creek, while the trail head parking lot is on the south side. This has caused confusion in the past. The reason for this strangeness is the removal of an old bridge from the south side access. It’s almost as if Parks would rather you didn’t find this trail, as the only sign on the highway indicating anything about a hiking trail here, doesn’t even have the name “Poboktan Creek” on it… This trail is an old one, built in 1921/22 as an important warden route on the south boundary of Jasper National Park. The warden station is officially closed now, but a noisy generator running at the site hints at some current use by Parks Canada. 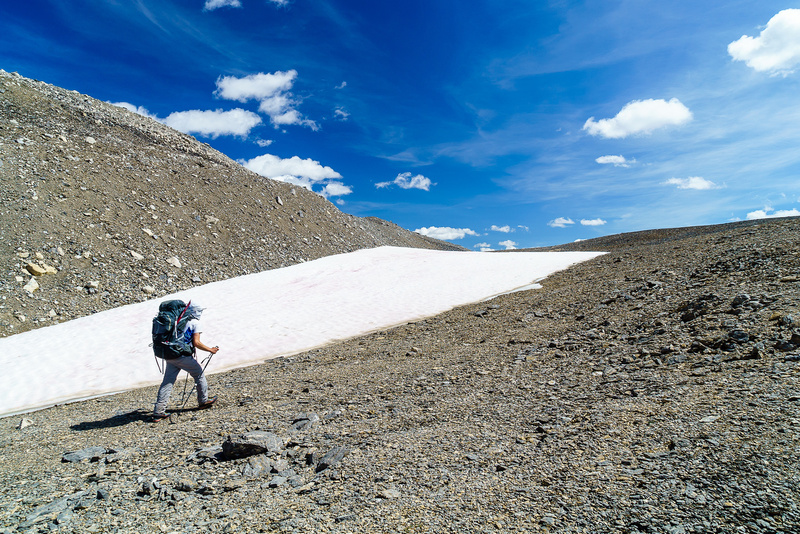 Our route on day 1 consisted of the Swan Pass approach to the normal bivy, crossing the Brazeau Icefield and ascending Mount Brazeau. A fairly full day! 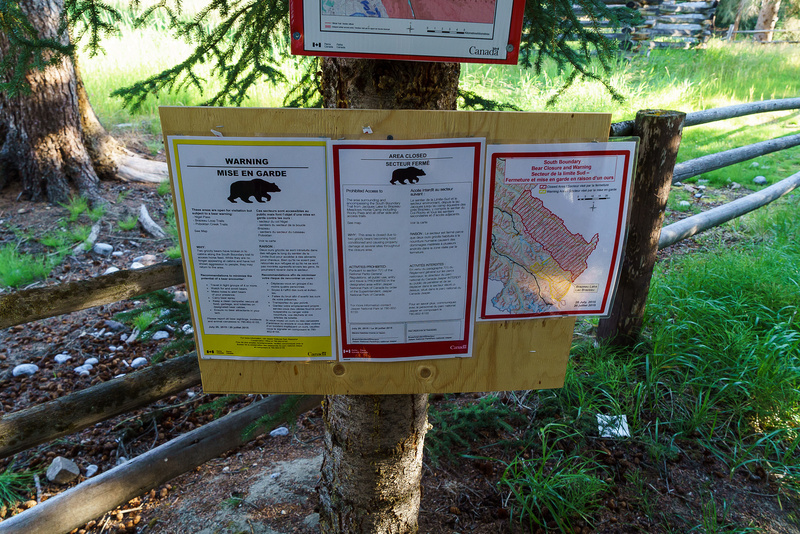 We were reasonably sure that a bear warning / closure on the South Boundary Trail didn’t apply to our intended route and thankfully, upon examining the trailhead signage, we were right! After crossing the bridge on the highway, we turned into the warden residence area and found the understated trailhead near the creek by an old horse corral. My 55 liter pack was light and compact for a four day / three night alpine trip as we decided to leave our helmets and extra ice tool in the car. This would prove to be a bit of a mistake, but so far we were expecting pretty easy climbing this weekend. With no rock rating and alpine ratings of I or II at most, how hard could it be right? Right. 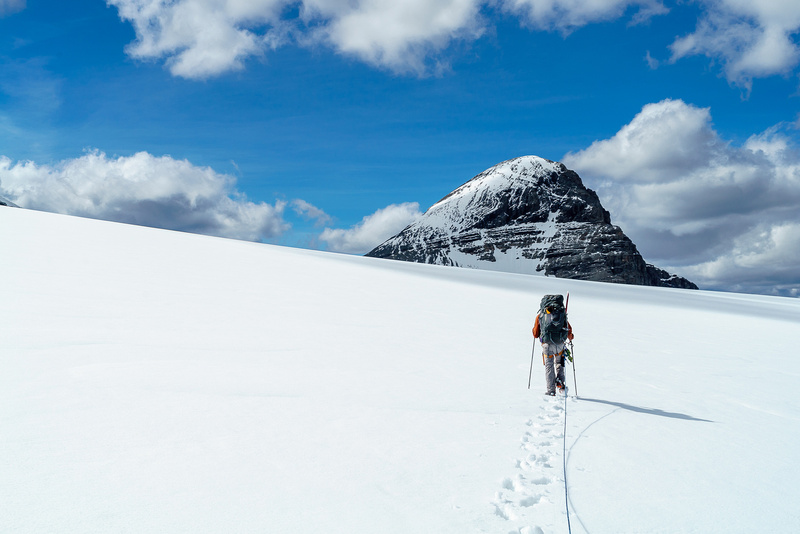 😉 Ben carried the rope, but I had the tent / mid and we each carried stoves / fuel for redundancy as we’d be depending on the stoves to melt water on the icefield. We also carried our summer alpine sleeping bags and mats since the forecast was for warm summer temperatures and plenty of sunshine. Of course toques, gloves and Gore-Tex were added, since we were climbing on a glacier all weekend. 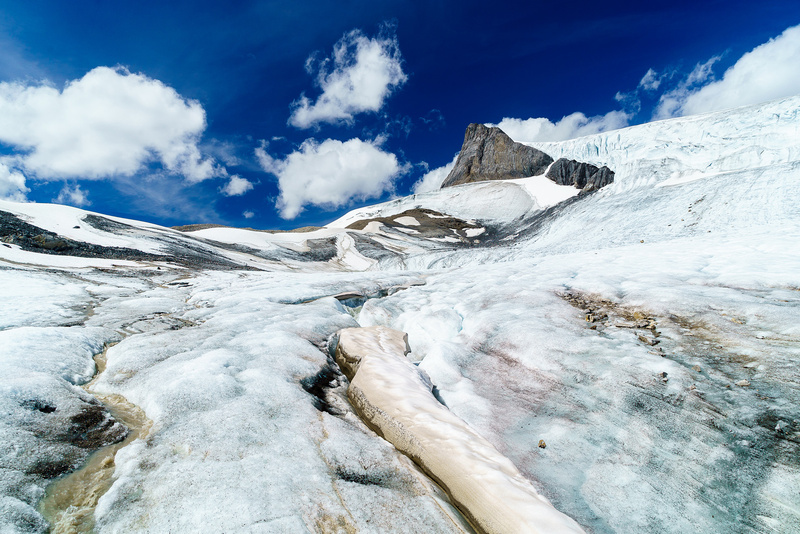 Most folks approach the Brazeau Icefield in one day, but don’t actually set foot on the glacier until the second day, choosing to set up base camp at an excellent bivy location at Swan Pass. Ben and I had other plans. 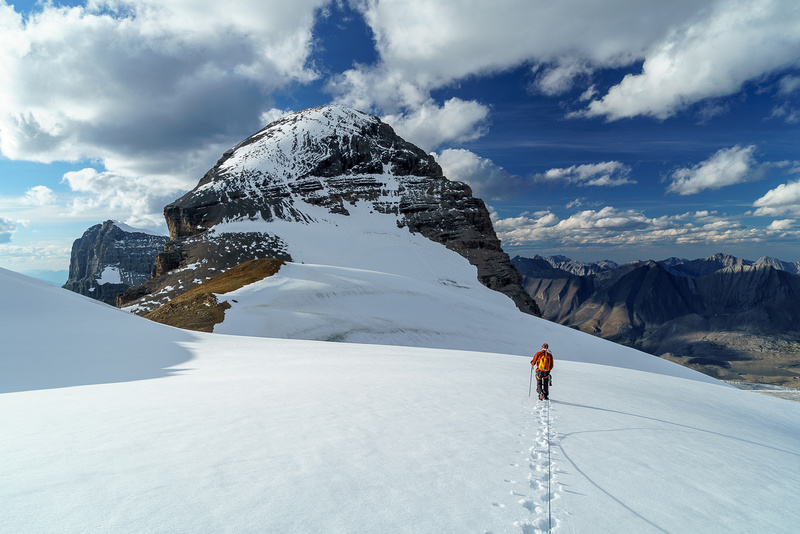 After consulting with Steven, we decided that the approach day would be too short to stay at Swan Pass, especially with our plan to ascend both 11,000ers in the area (Brazeau and Warren) on this trip. 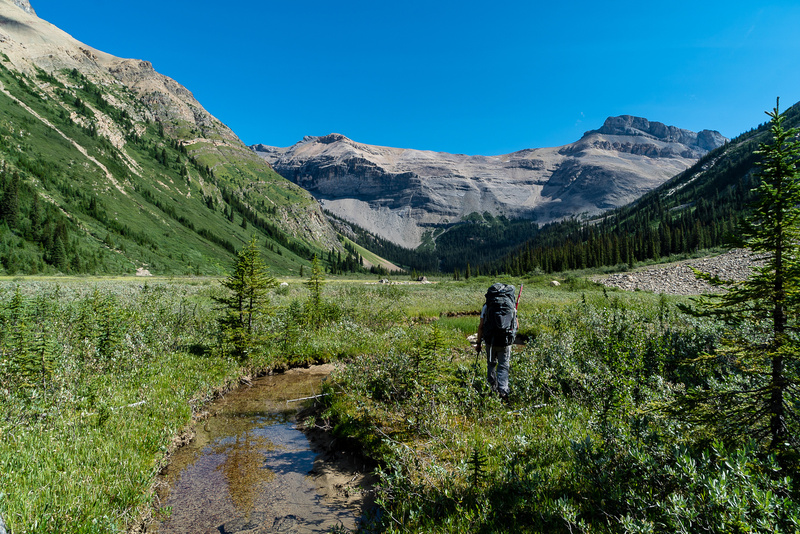 Our original plan was to make it all the way below the east or even north face of Brazeau on day one, as close as possible to Mount Warren which we would climb on day two before moving camp back up the glacier and ascending Brazeau, Valad and Henry MacLeod on day three. The best laid schemes of mice and men! 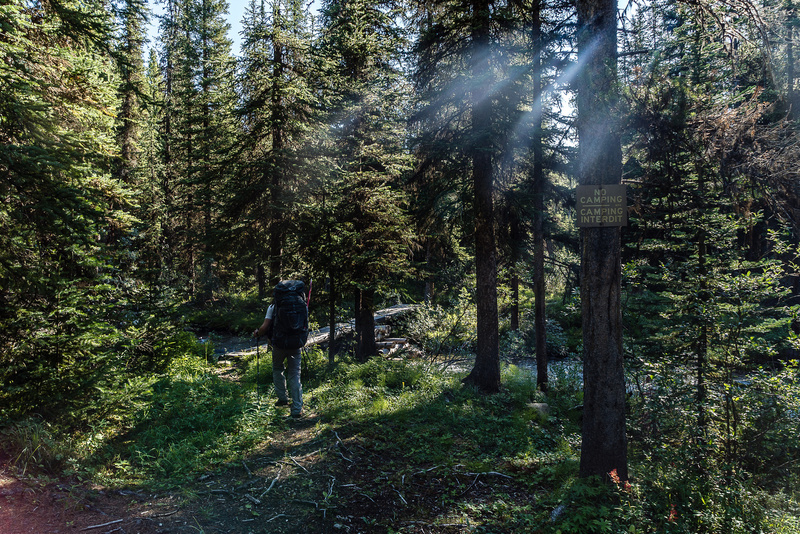 Don’t expect a wide trail up Poboktan North Fork Creek. The sun was warm on our backs as we made our way swiftly up the Poboktan Creek trail. 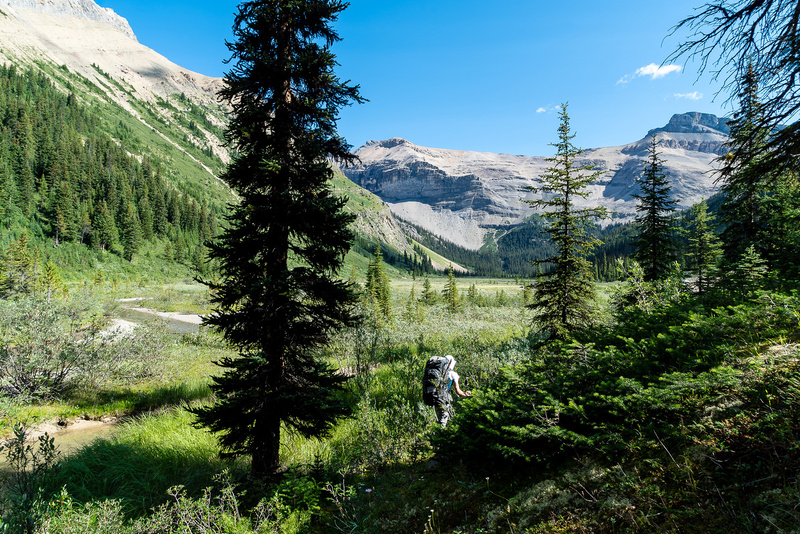 Time passed quickly, as it always does on the approach, and soon we were passing the Maligne Pass turn off after about 6km of hiking. Just over 15 minutes later we were crossing two bridges near the Poboktan Creek campground and looking carefully for a trail heading north, from the left side of the main one. Sure enough – we found it after looking twice, it was not as obvious as I would have thought, given the popularity of this mountain. 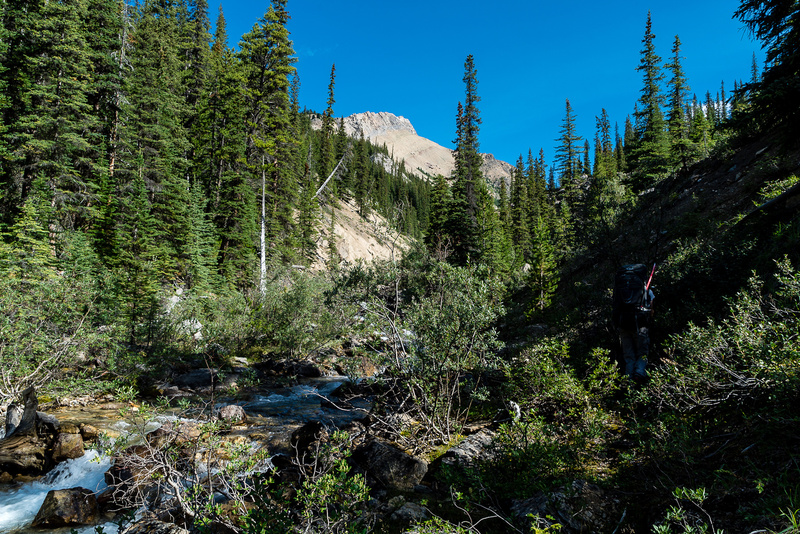 As we followed the faint track through the bush I was reminded once again of the beauty of the Rockies and how different it always is to imagine what a trip will be like and what it actually ends up being like when you finally do it. 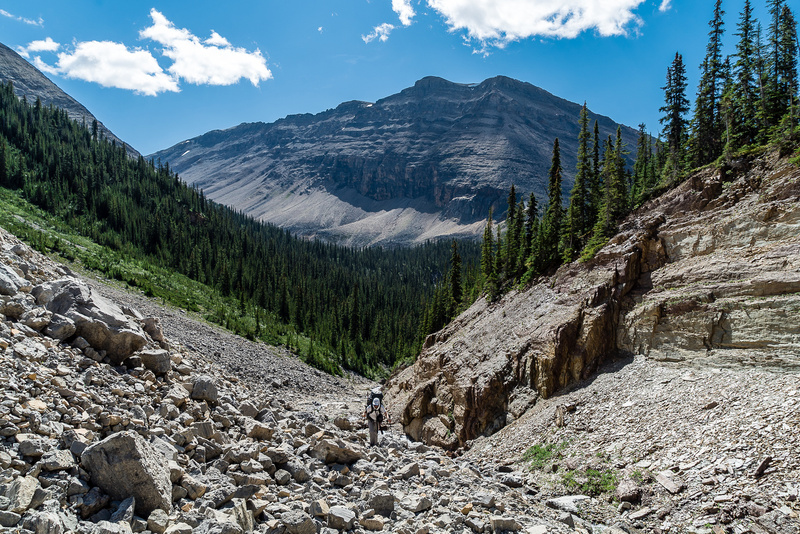 I knew the Swan Pass approach was supposed to be gorgeous, but as we climbed steeply up beside the rushing north fork of Poboktan Creek we were surprised by flowers, waterfalls and rock gardens, randomly scattered along our route. 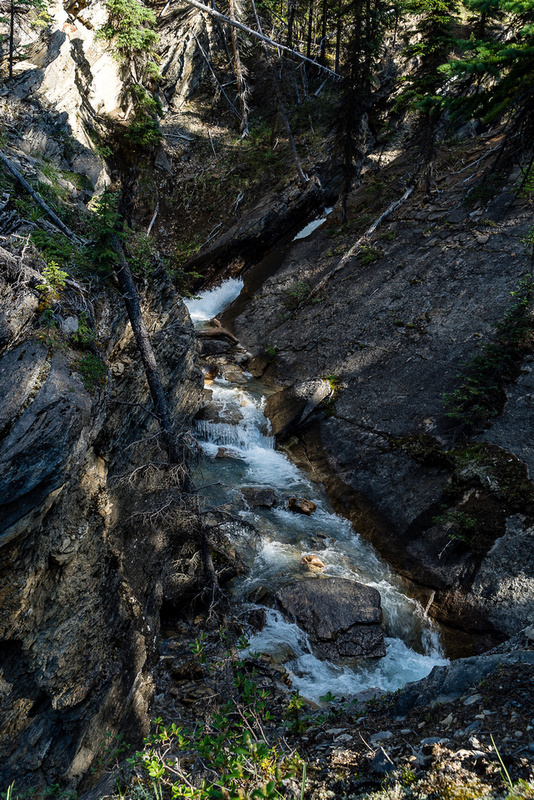 Shortly after ascending through a rock garden we descended slightly and came out at a surprisingly large open valley with the north fork stream running in braided channels towards us from a waterfall at the far end. We managed to keep our boots dry (ish) by sticking close to the right hand side and even ended up discovering a nice blue tarn before moving back into the middle of the valley. After crossing the stream to a cairn on the right hand side, just below the waterfall, we climbed up a steep, faint trail in the forest next to the falls (right side), curving left before coming out of the trees in the rocky creek bed above the falls. From here we could see a brilliant white glacier high above, reflecting the strong summer sun back at us and inviting us to continue our journey upwards. Ben crosses along a gorgeous tarn sitting just above the creek in the approach valley. Bivy Ridge rising in the distance here. Ben crosses the wide braided-channel valley on nice dry gravel flats. The nice waterfall at the end of the open valley. There’s a cairn here leading you to the climber’s right side of the falls where a faint trail leads up steeply through the forest. 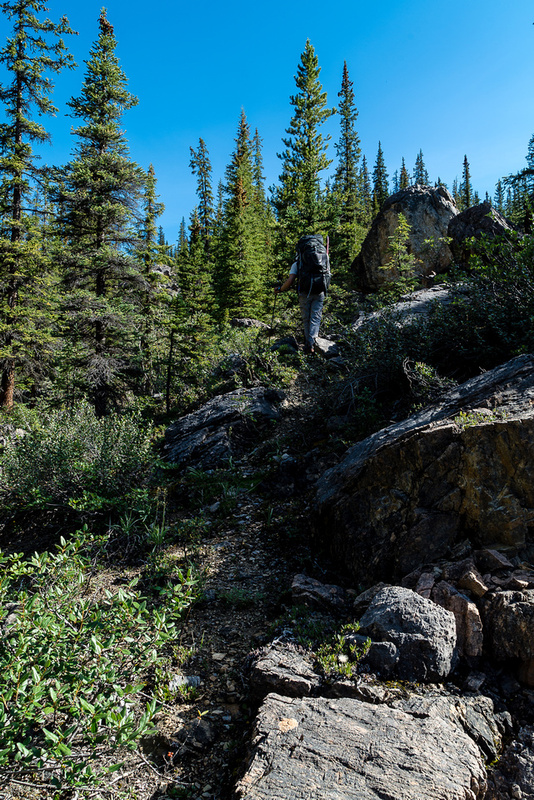 If you go climber’s left you’ll be bushwhacking. You’ve been warned. Up we went! From above the falls to the high bivy it’s a heckuva grunt up a mix of boulders and scree either right in the creek bed or above the creek on climber’s right. 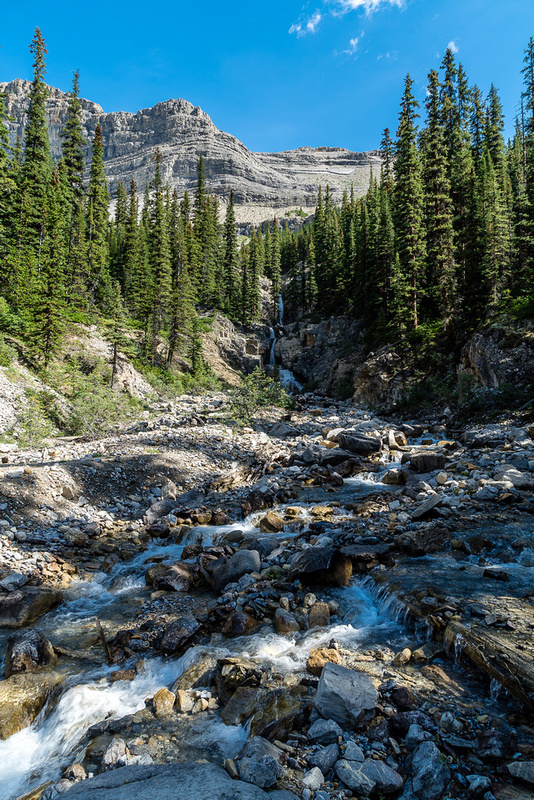 We were briefly confused by the cliff band that must be traversed, but soon figured it out – the key is when you see a large waterfall coming off complex terrain, look up to the right and you’ll see an obvious traverse above the cliff band. This is shortly after a perfect bivy site that is way too far below the objective to be used effectively. 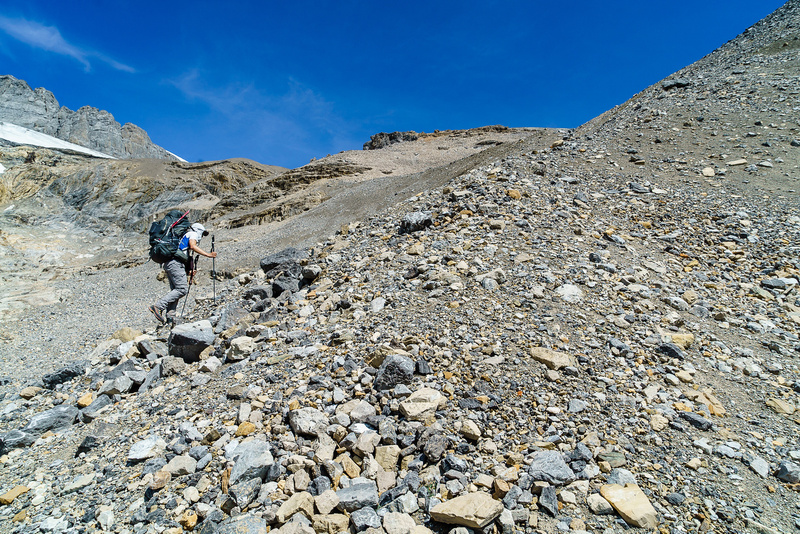 After traversing just above the cliffs on a trail worn into the scree, we turned steeply up old moraines on our right, trending slowly right and upwards to the high col / bivy site. A short walk across the upper col brought us in view of the bivy site – gorgeous views into the next valley over some tarns and a great stone corral made us wish we were stopping here already – but we weren’t! Heading up past the lower bivy site towards the cliff traverse at right. Ben grunts up the loose scree / moraines beneath the high col and Swan Pass. Great views opening up behind us including Sunwapta at left. Swan Pass. 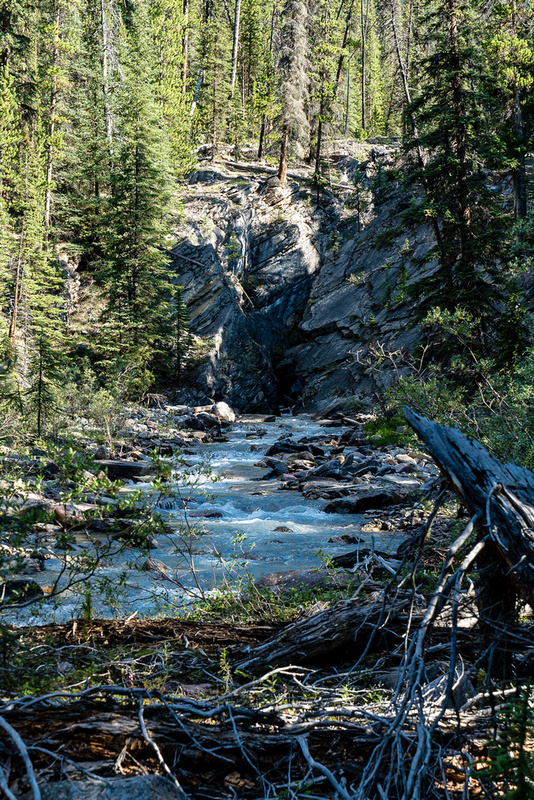 The bivy site is awesome – the lower bivy corral has running water. From Swan Pass looking east. 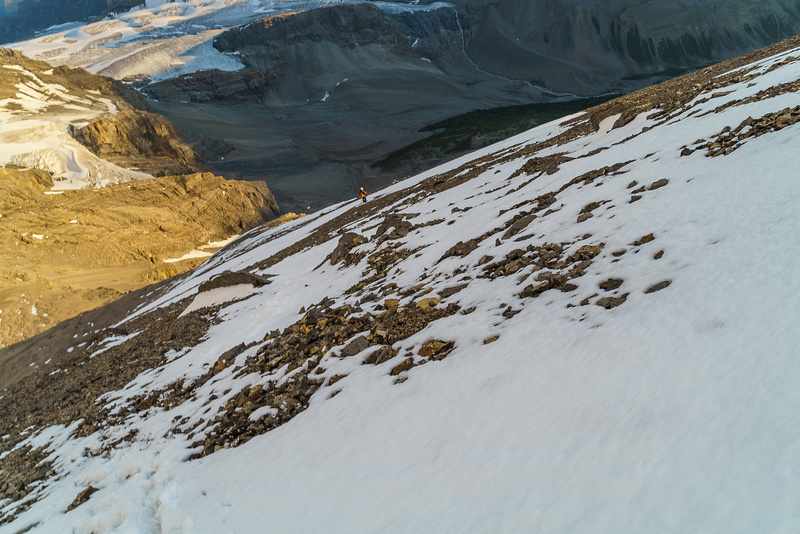 It took us only around 5.5 hours to make the high bivy which meant we still had plenty of day light to traverse the Brazeau Icefield and hopefully camp somewhere close to Mount Warren. 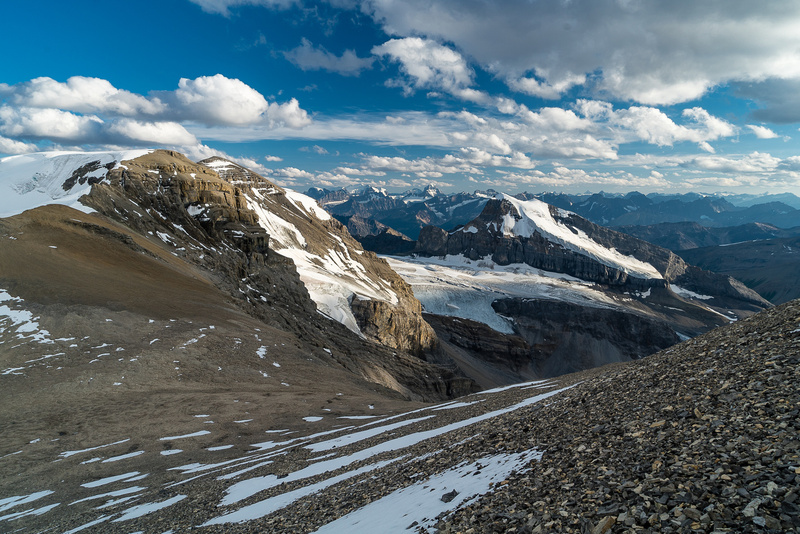 After leaving my bear spray and some garbage that I didn’t need over the next few days tucked into a nook in the bivy corral, we continued over the moraine beside the bivy and descended to the lower icefield. Lots of signage at the trailhead. 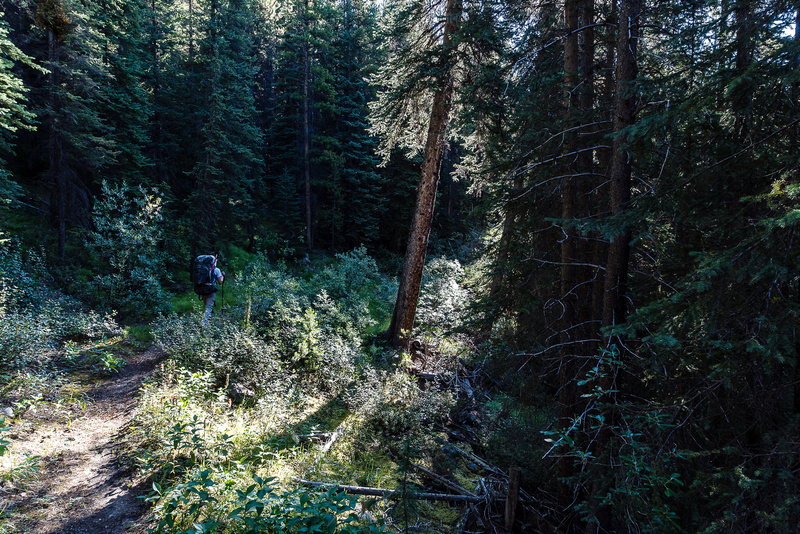 The South Boundary Trail is a full closure thanks to two young grizzlies who have acquainted themselves with human food. 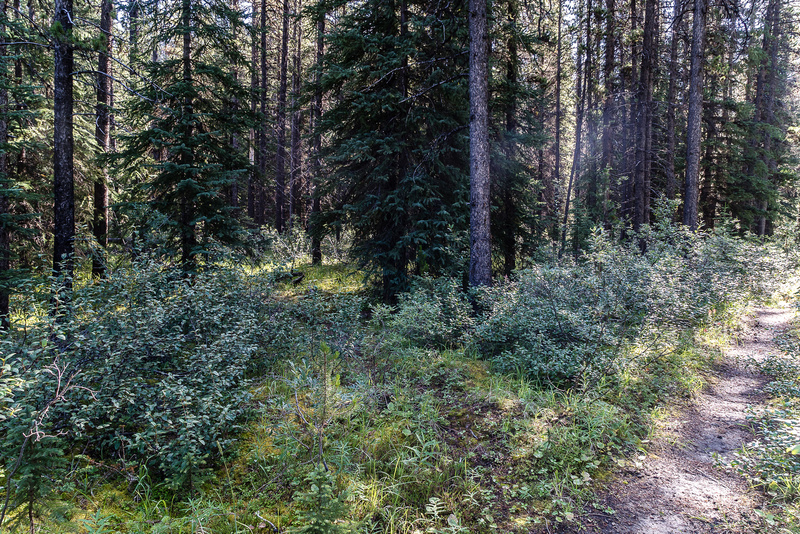 The Poboktan Creek trail is wide and easy to follow. 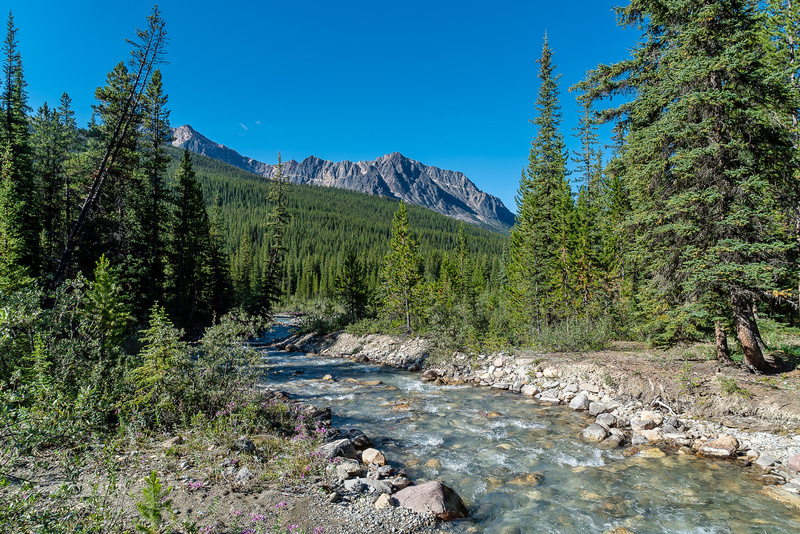 While easy to follow, the Poboktan Creek trail is kind of boring for the first 5 or 6km until you finally get this view looking back down stream. It's a lovely day in the shade, but no camping allowed at km 6! 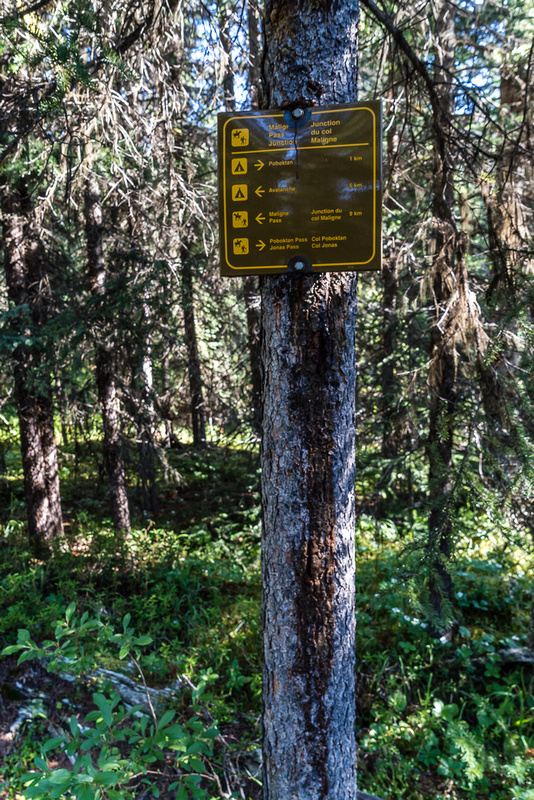 You must go another km to the Poboktan Creek campground. 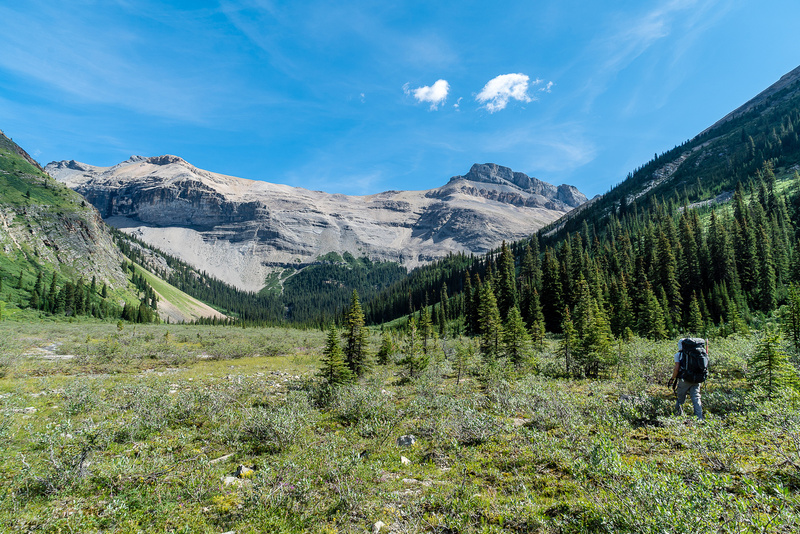 The Maligne Pass trail branches off to the left here. 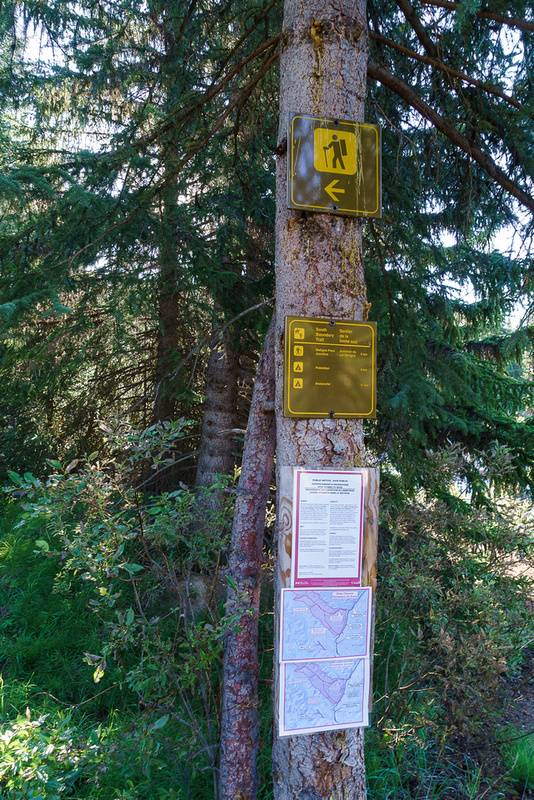 We walked past the decommissioned trail to the Maligne Pass area. Near the Poboktan Creek campground. Almost immediately a nice falls shows up on the left side of the trail. Falls along the Poboktan North Fork (PNF) creek. Don't expect a wide trail up the creek. After some fairly bushy hiking along a faint trail, we came to a rock garden which we ascended following the only cairns on route. Looking back at our approach valley, over the rock garden we just ascended along. A delightful, open meadow with the PNF creek flowing through in braided channels greets us after the rock garden. Ben crosses along a gorgeous tarn sitting just above the PNF creek in the valley. There's a cairn here leading you to the climber's right side of the falls where a faint trail leads up steeply through the forest. Looking back at Ben as we continue up the PNF creek above the waterfalls. The summit in the bg is an outlier from Waterfall Peaks. The glistening, white glacier beckons us onward and upward from far above. Heading up past the lower bivy site towards the cliff traverse. Looking along the traverse cliff band (R) and down valley from our approach (L). Ben grunts up the loose scree / moraines beneath the high col.
Ben tops out at the col above me. Looking back at our approach from near the col.
Ben walks towards the bivy site. The bivy site is awesome - the lower bivy corral has running water. It was pretty obvious that the glacier was melted back quite a bit as we crossed the lower icefield to the rock ledges that would take us up to the upper glacier and past the obviously impassible ice fall on our left. 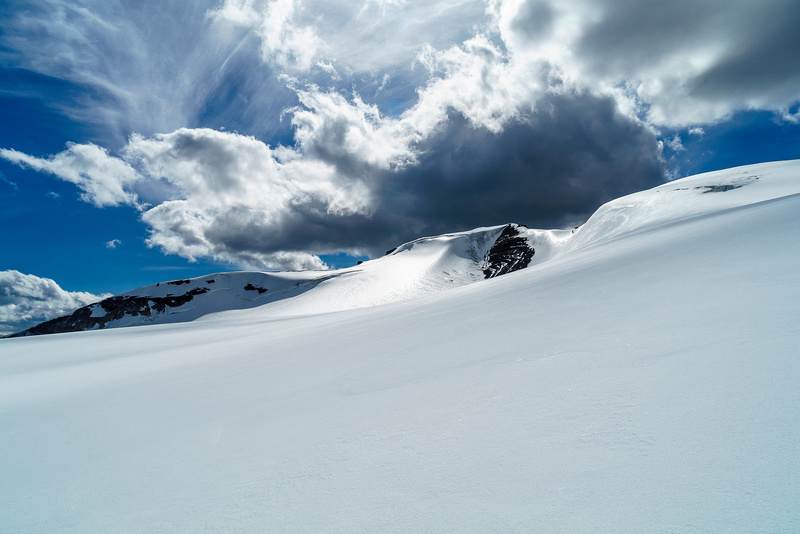 There were raging rivers of water winding their way down crevasses and chutes in the center of the ice – falling in one of these would be a wild ride! 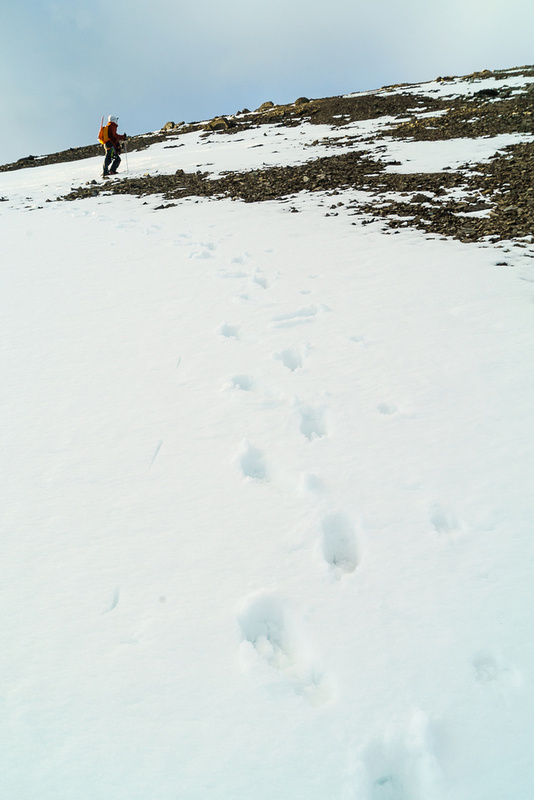 We managed to find a nice exit onto the rock and traversed up and left until we could step onto the main glacier which was melted completely bare at this lower access point. The temperature was very warm and the snow was excellent (!!) slurpee quality so when we started encountering covered crevasses our movement went from “efficient” to “very, very non-efficient“! 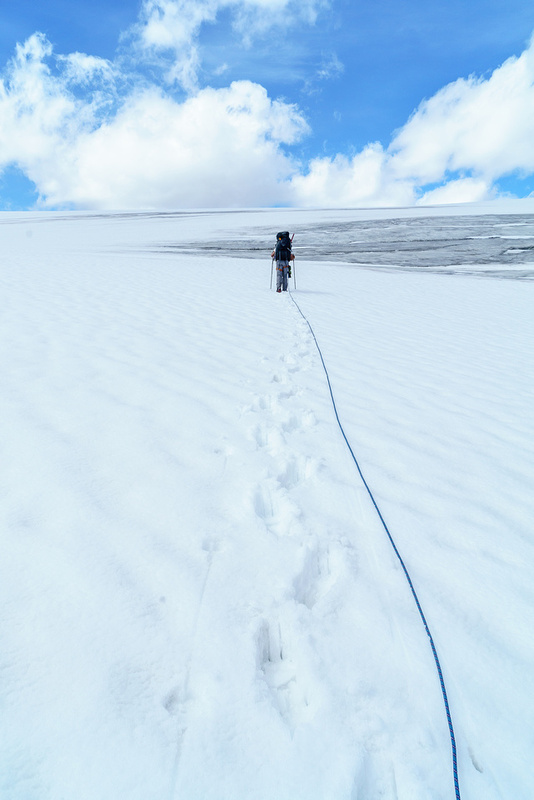 Ben carefully probed in front of himself and soon we started encountering a great many crevasses, some of which were problematic to cross safely on the sketchy snow bridges. It was all good fun for a while but eventually we found a crevasse that didn’t seem to have a way around. We spent almost an hour before finding a way across it! 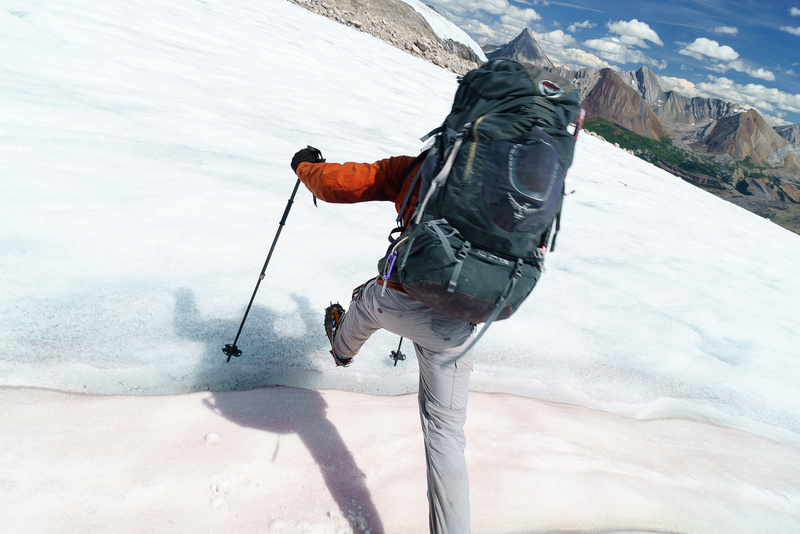 Summer travel was proving to be a PITA on this melted out glacier… We pressed on. Looking back (south) from near our glacier bivy. Poboktan rises impressively at right. It was after the last problematic crevasse that I suggested instead of descending under Brazeau to camp near Warren, maybe we should reconsider our options and camp at the top of the icefield, near Brazeau and possibly even climb Brazeau this first day – to give us options on subsequent days, especially considering the rate of the melt going on around us. Ben agreed and we trudged on, probing carefully for holes and finding a good many all around us. 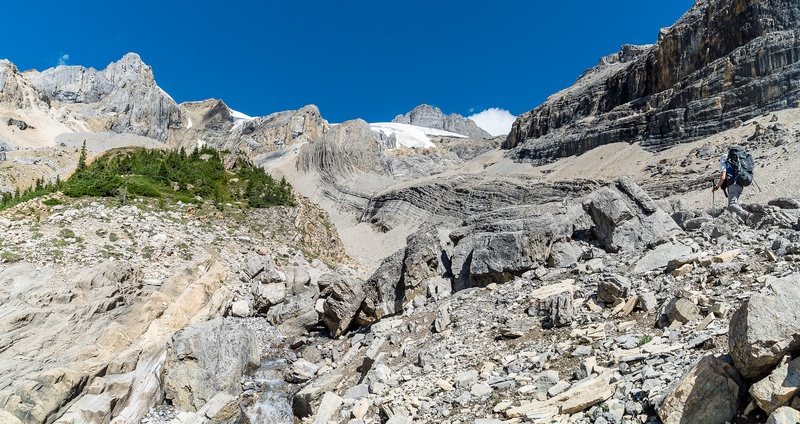 Eventually Brazeau came into view and we could see the rocky shelf that delineates the upper Brazeau Icefield from the lower one going around to Warren. We trended towards Brazeau until it was obvious that we were close enough and we made the decision to set up camp. Setting up camp was a bit humorous. The snow was about 1 foot deep and then we were on the glacier already! After setting up the mid, I stepped into a crevasse that was hiding about 2 feet off our slushy snow wall. Ben decided to name this icy pit, “Charlie” and we used him as our biffy. 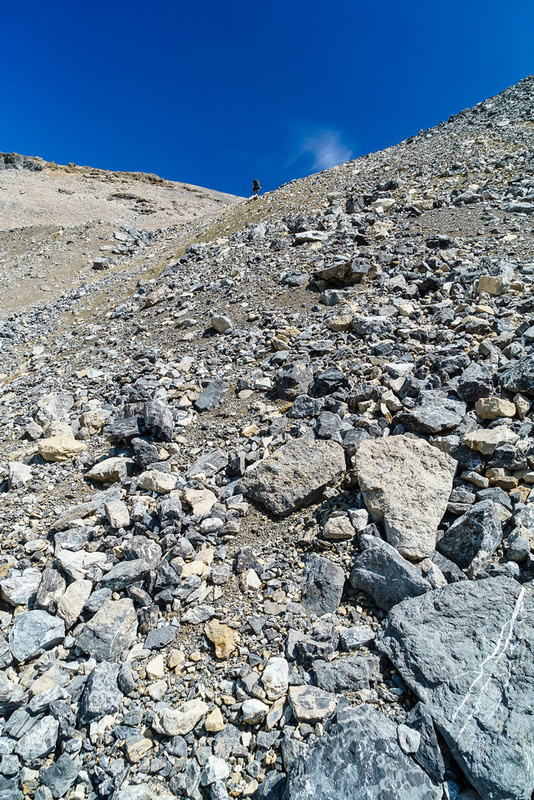 😉 We had some second thoughts about ascending Brazeau but by 19:00 we were reattaching the rope and plodding towards the hulking mass of scree and snow, hoping to make it back by dark. Mount Brazeau from our camp – we had to access it via slopes to the left, out of sight. Looking back at our approach tracks from the bivy, showing how we skirted some slots along the way. Most of the snow you see on this shot will be melted 24 hours later, but it made for a nice ascent of the upper mountain. Mount Warren is just visible to the left of Brazeau and looks a LONG way off. Because it is. I’m not gonna lie – it was becoming a grunt at this point. 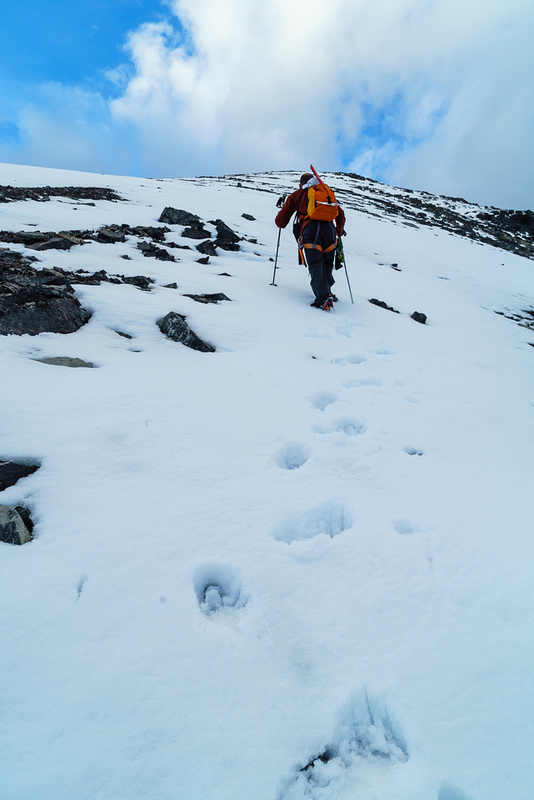 Climbing Brazeau itself was technically pretty easy from our high camp on the glacier. 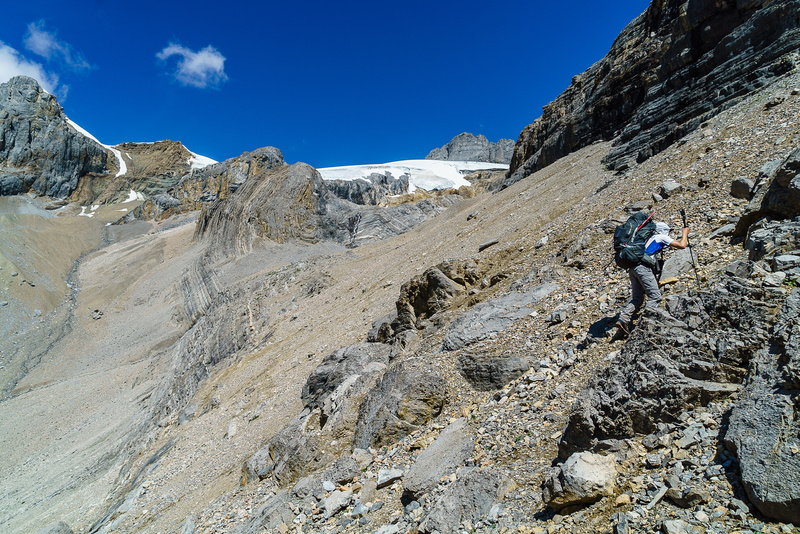 We gained the ridge between Brazeau and Valad Peak before dropping down towards the col and only then finally ascending scree and snow to the summit. 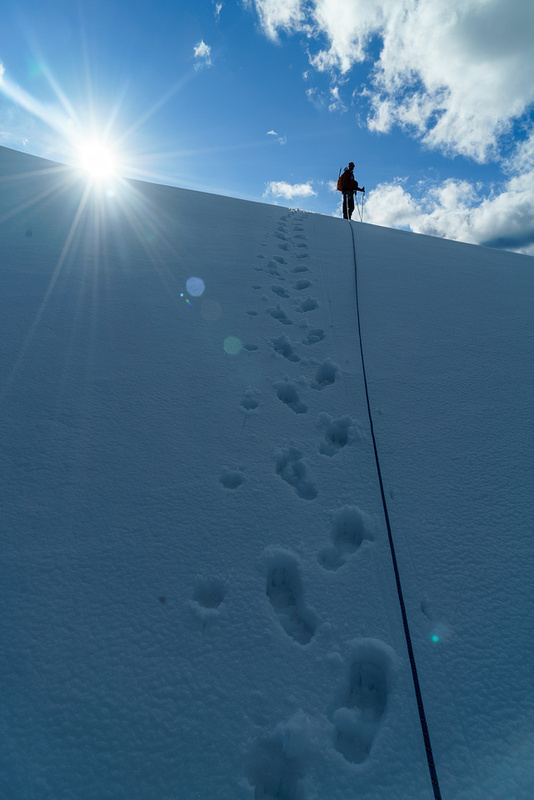 The snow was much steeper than we thought, but it held good enough and we managed to make the summit within about 2 hours of leaving camp as the sun was starting to set in the west. We got some incredible views, especially looking south and west from the summit. 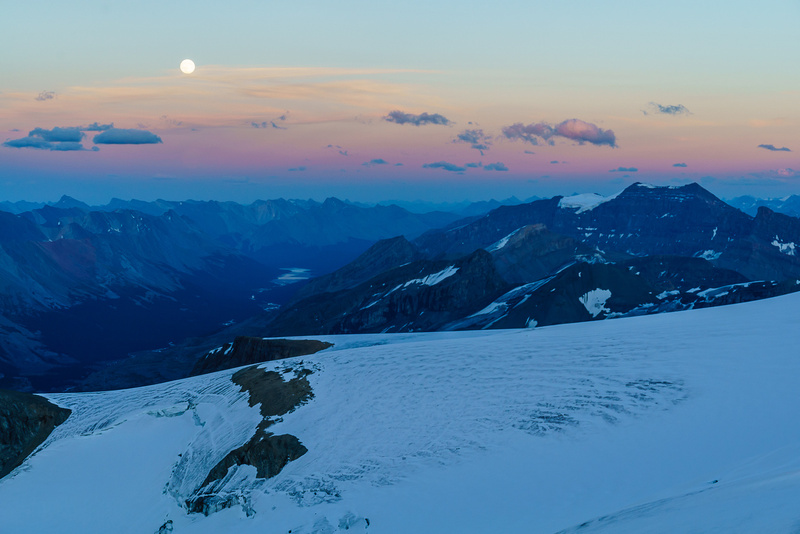 As we descended in a stiff breeze the views only got better until the sun was completely set and the blue moon was out! Our peak casts a pyramid shadow on the valley below as we near the summit. Incredible views towards Brazeau Lake (L) with Poboktan rising at center and our approach at bottom. 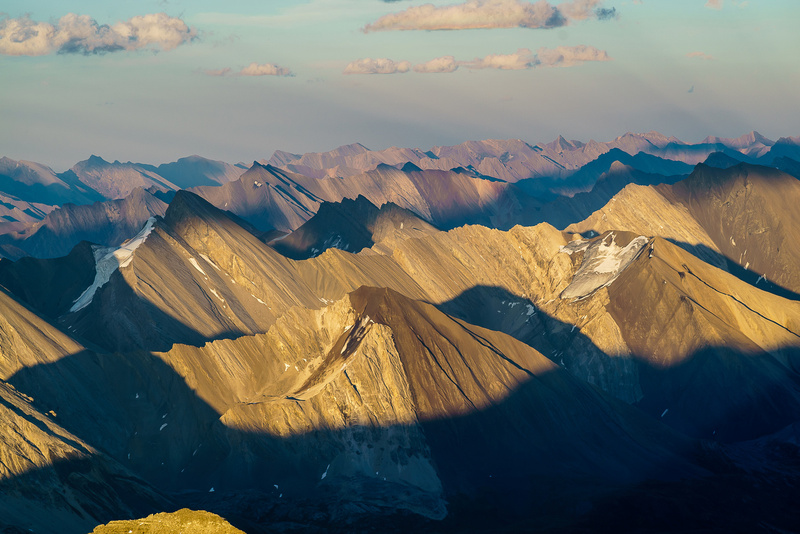 Peaks include from R to L, Coronet, Alberta, Woolley, Diadem, Twins Tower, North Twin, Stutfields, Cromwell, Kitchener, Snow Dome, Athabasca and Sunwapta. Vern on the summit of Mount Brazeau with Brazeau’s shadow behind him. Poboktan Mountain comes very close to 11,000 feet high. Amazing lighting with the shadow, sun beams and even a blue moon thrown in! 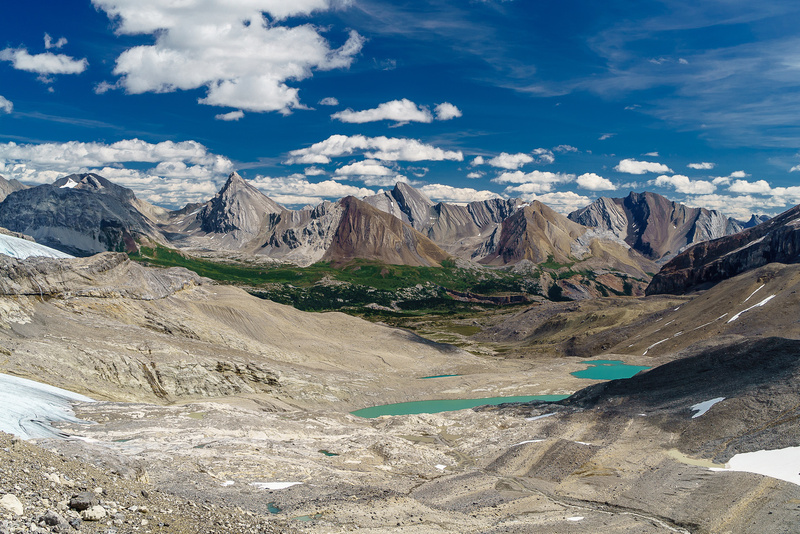 Brazeau Lake in the distance, is one of the largest wilderness lakes in Jasper National Park. 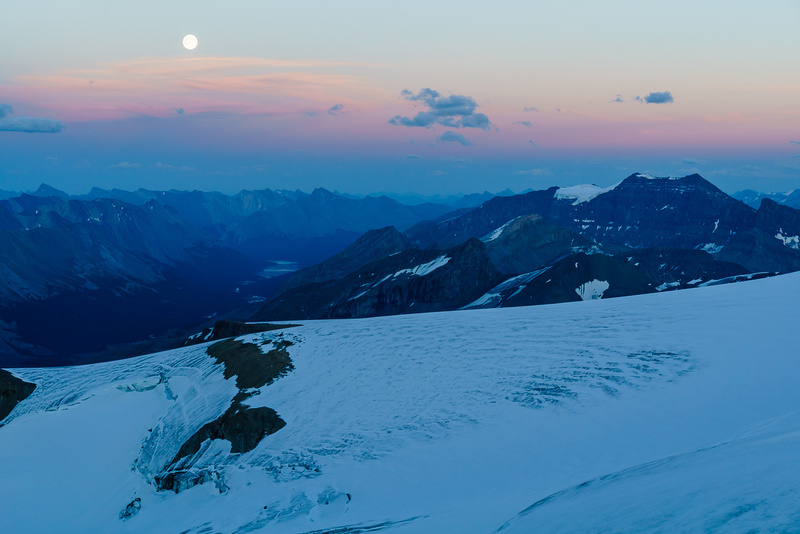 The blue moon, Brazeau Lake and Poboktan Mountain as the sun dips below the western horizon. We carefully retraced our steps and stumbled back into camp at after 23:00, very tired after a long day. I couldn’t believe that I drove from Calgary, did the entire approach and managed to ascend Brazeau in the same day. It felt like a fairly long one – but it felt really good to be done our first 11,000er while conditions were still reasonably good. We prepared for Warren and tried to sleep on the cold glacier with an even colder wind determined to blow our mid away. The one big disadvantage of sleeping where we did was the cold wind that didn’t make our summer sleeping gear feel like a good idea. The lower icefield as we crossed over it, the ice fall on the right. Looking back over the lower glacier as we head up the rocks separating the lower and upper ice fields. 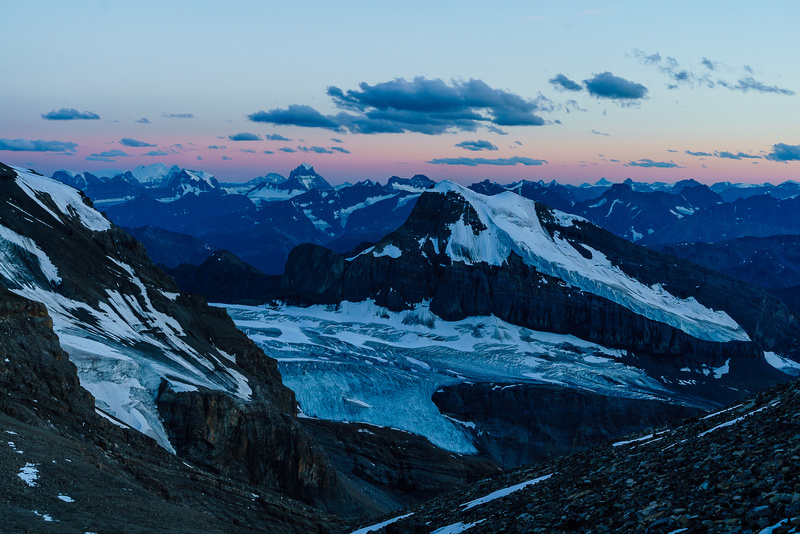 The lower icefield isn't visible as we start up the main glacier from the rock band. On the main glacier now - note the slushy snow. Steep roll on the glacier. The afternoon goes nuclear as we spot Brazeau peaking up on the left. Looking back (south) from near our glacier bivy. Mount Brazeau from our camp - we had to access it via slopes to the left, out of sight. The sun and our slushy tracks as we head for Brazeau from camp. Mount Warren is just visible to the left of Brazeau and looks a LONG way off. Because it is. 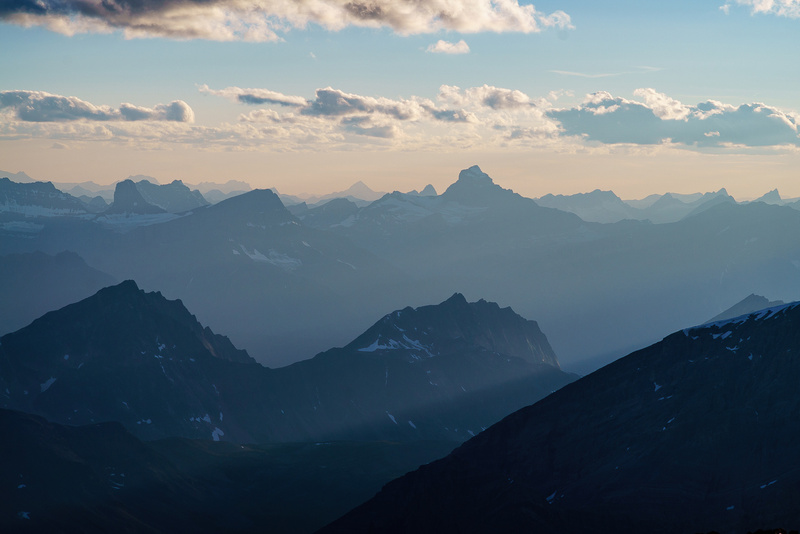 A telephoto looking past Brazeau with Warren's summit ridge and Maligne Lake in the bg. Looking back as Ben starts the height loss beneath Brazeau. 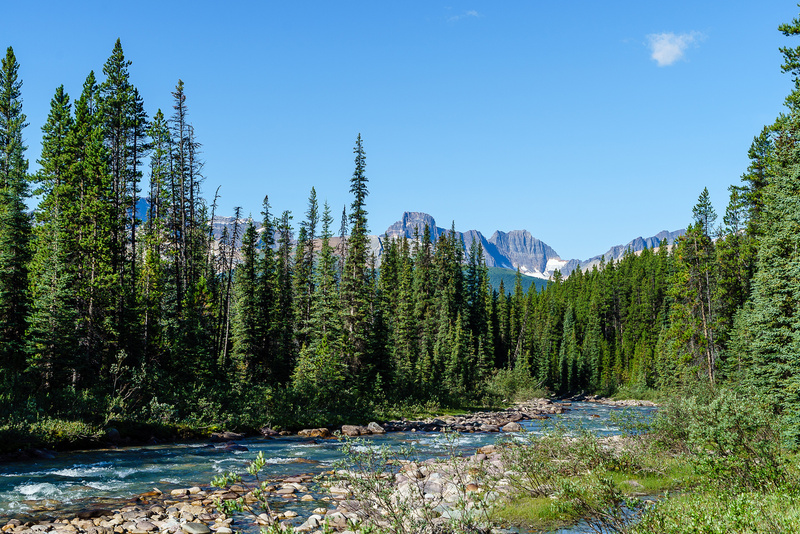 The south face of Brazeau beckons us. Breaking through the cliff bands, we see 'clear sailing' to the summit. I'm not gonna lie - it was becoming a grunt at this point. 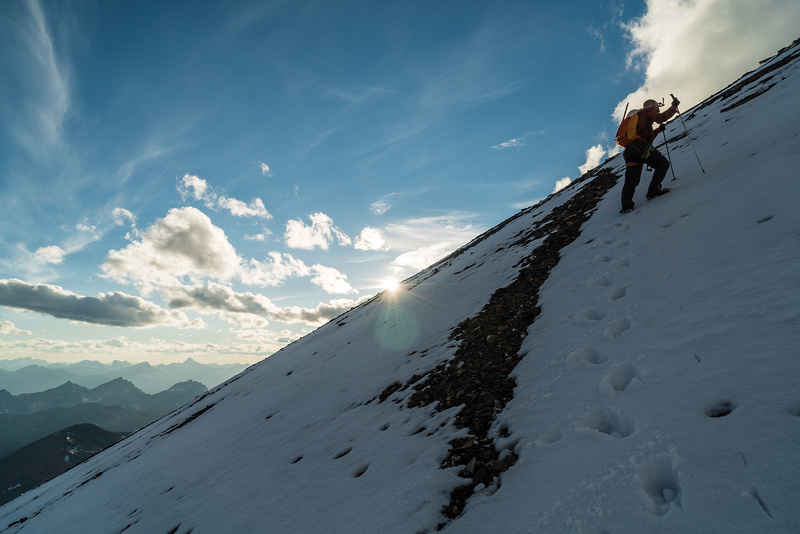 The final push to the summit of Mount Brazeau. Brazeau casts a pyramid shadow on the valley below as we near the summit. 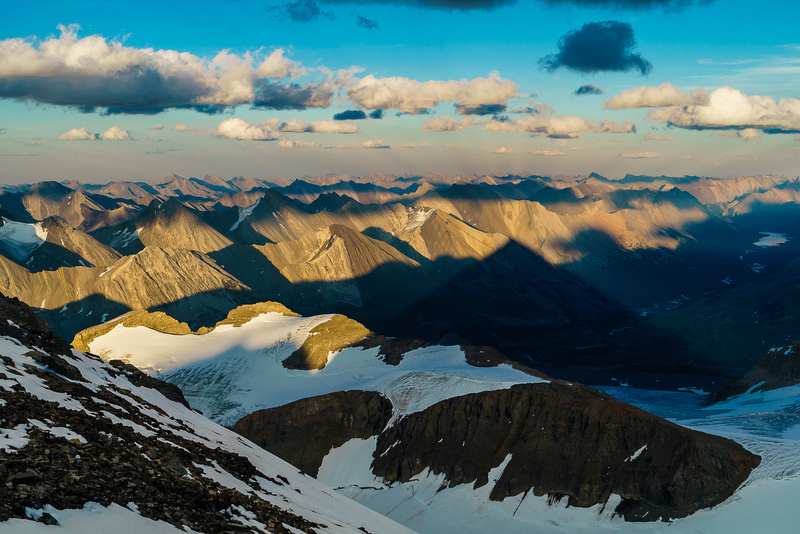 Great sunset views off the summit of Mount Brazeau looking back over Valad and Henry MacLeod. 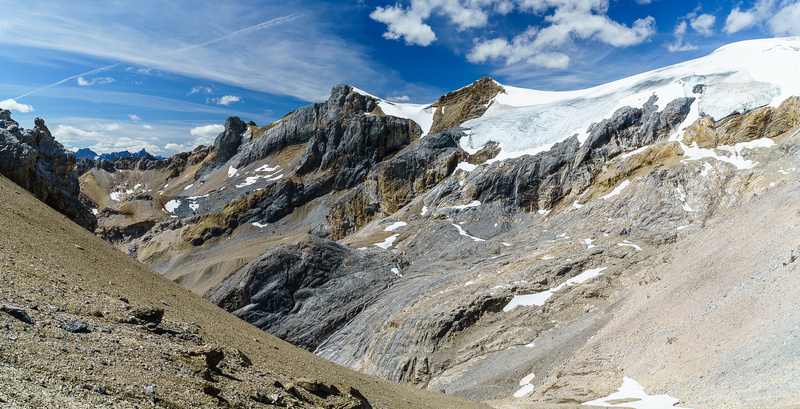 Huge summit panorama from the apex of Brazeau Mountain. 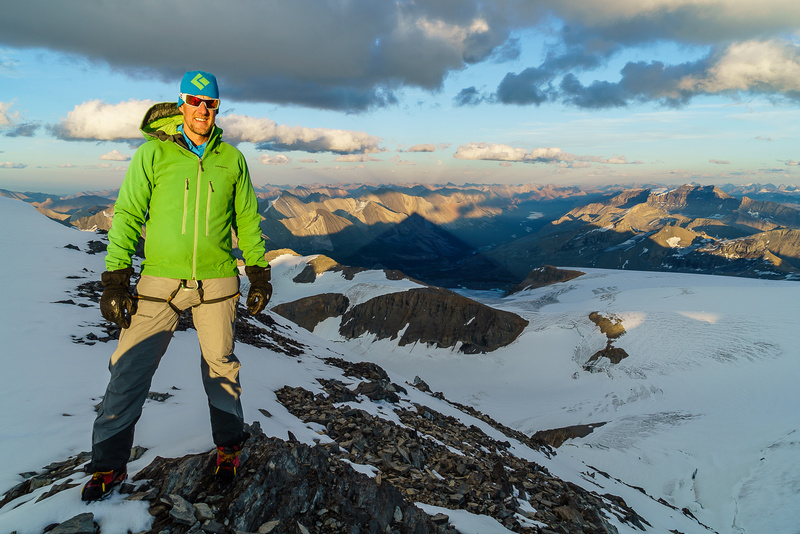 Vern on the summit of Mount Brazeau with Brazeau's shadow behind him. Mount Fryatt is another favorite 11,000er of mine. 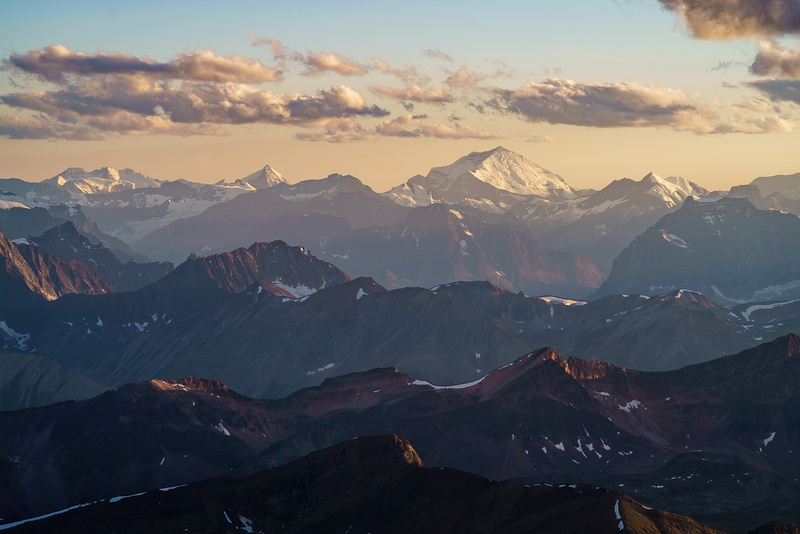 The mighty Mount Clemenceau is a gorgeous 11,000er and one of only 4 above 12,000 feet high. R to L, Tsar, Coronet, Alberta, Woolley, Diadem, Twins Tower, North Twin, Stutfields, Cromwell, Kitchener, Snow Dome, Athabasca and Sunwapta. 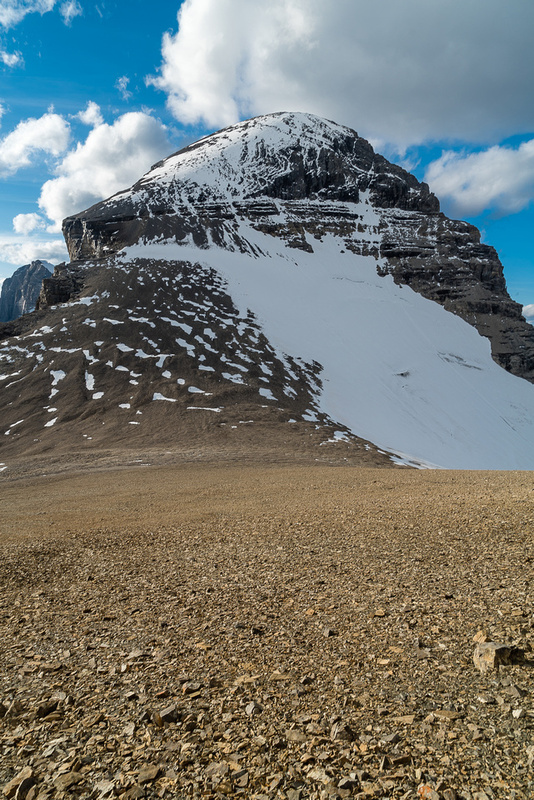 The North Face of Mount Alberta is intimidating even from this distance! Ready to start our descent. Brazeau's shadow with it's namesake lake. 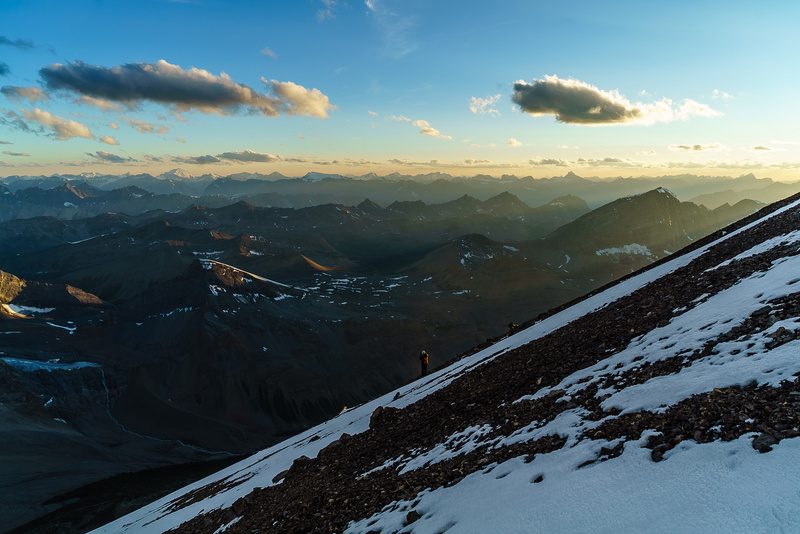 Descending past a small cliff band (R) with Valad Peak catching the last of the sun. 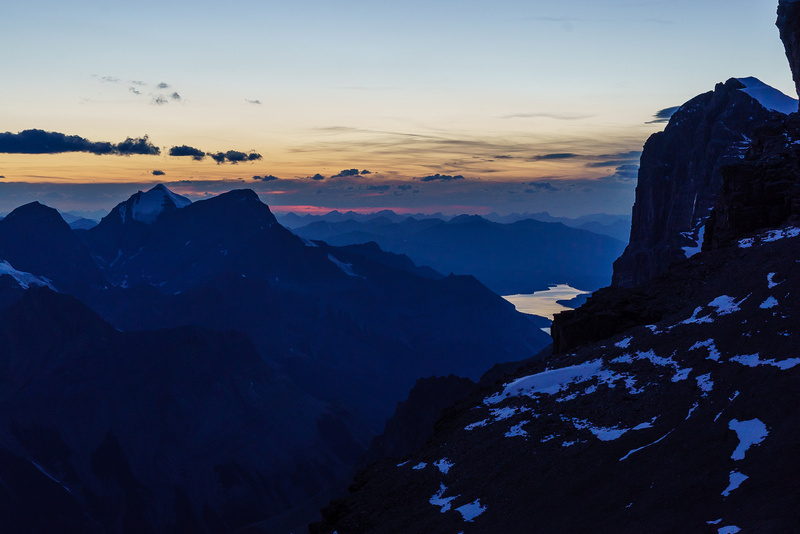 The sun has now set and we are on our way back to the bivy. The blue moon rises over Brazeau Lake. Yep! Now we have to re-ascend part of Valad Peak before getting back to our bivy. 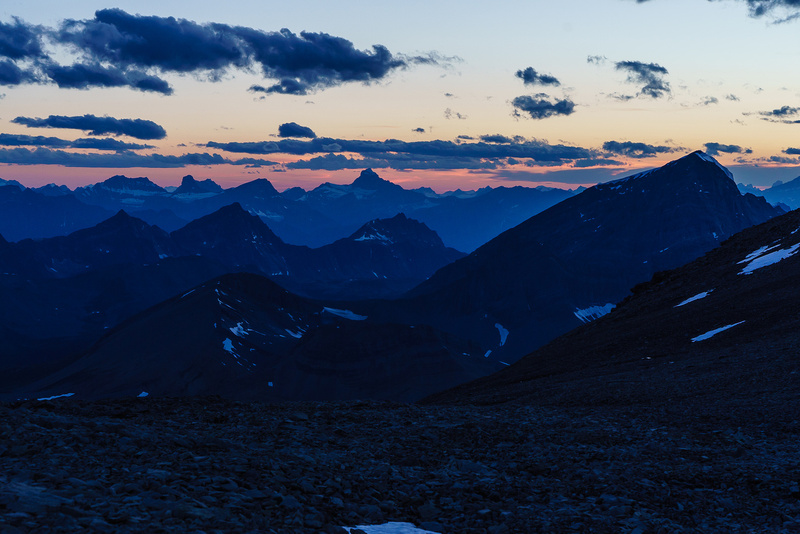 A last glance past Mount Warren over Maligne Lake in the dying daylight. 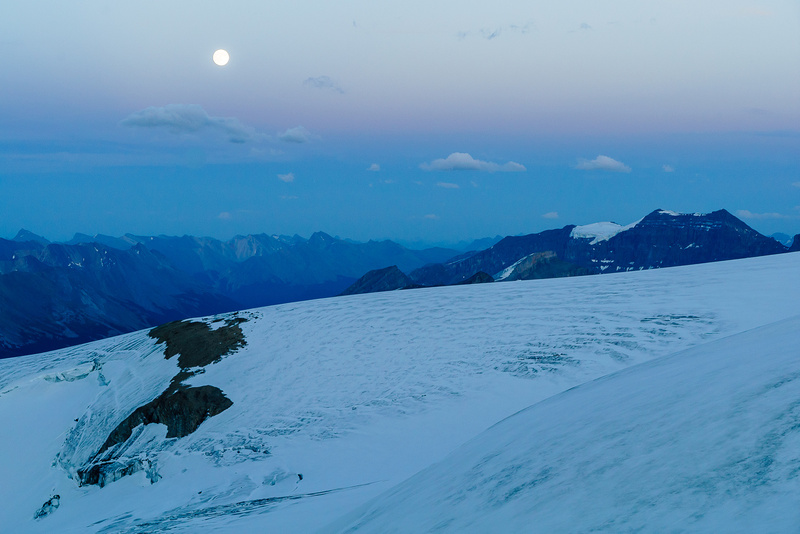 Avoiding crevasses as we navigate under moonlight towards camp which is on the shoulder above the slots on the left.